Whisk together the dry ingredients in a separate bowl. In a stand mixer, beat butter and sugar together until creamy. Beat in egg and vanilla. Add dry mixture to the butter mixture, and beat just until barely combined. Use your hands to knead the dough together; it will be very dry. Flatten into a disk, and wrap in plastic wrap. Refrigerate for at least 2 hours. Preheat oven to 350 degrees F. On a floured surface, roll the disk until 1/4″ thick. 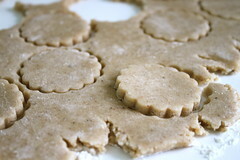 Using a scalloped cookie cutter at about 2″ in diameter to cut out cookies. Bake for about 15 minutes (check at 10 minutes–ovens vary! 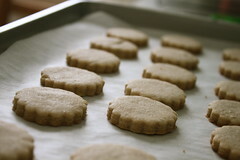 ), until edges are just slightly golden brown. 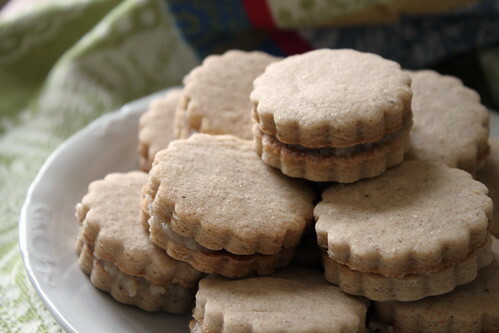 Make the cardamom buttercream (see below). 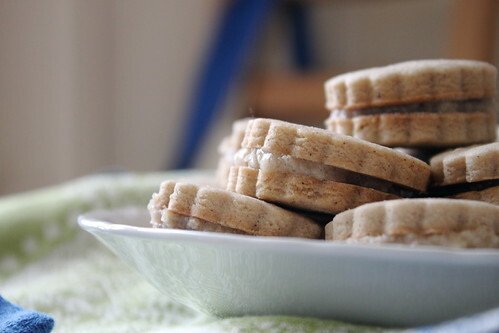 When cookies are completely cooled, to assemble cookies, pipe or spread about a tablespoon of the buttercream on the middle of one side of the cookie, then sandwich together. 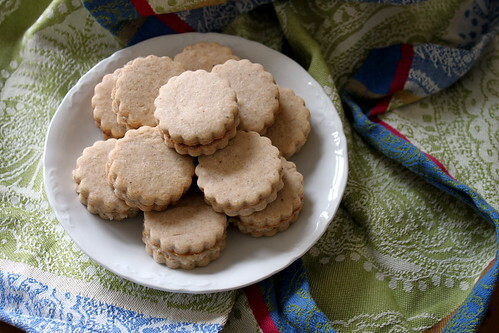 Combine butter, 3 cups of sugar, milk, vanilla, and cardamom in the bowl of a stand mixer and beat well. Add sugar by the 1/2 cup as needed to reach spreadable consistency. If icing becomes too thick, add a tablespoon of milk. These look delicious, I can’t tell that there’s anything wrong about the buttercream! I know what you mean about being a perfectionist though. I take my not so great baked goods to work anyway because I’d hate for them to go to waste. My coworkers don’t seem to mind either, they’ll eat just about anything. We had a potluck the other day and I made swiss meringue buttercream for the first time, but for some reason it turned grey?! Everyone still ate all of the cake and said it looked like a pretty “silver” cake. We are our own worst critics! How funny, I was JUST google searching for a book on the science of baking!